Want to know what it feels like to have your leg bitten by a shark? Just ask Joseph Tanner the 29-year-old surfer in Oregon who is now recovering in a Portland hospital from a shark attack. Tanner spoke with reporters recently marking the first public statements about the incident that made headlines around the country. 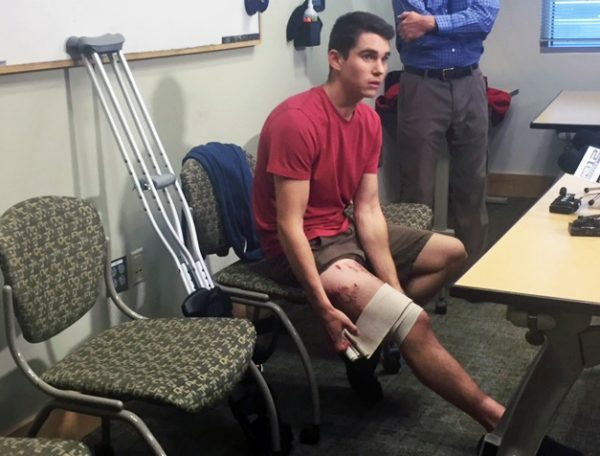 Tanner was surfing near Cannon Beach on Oct 10 when a shark bit his entire leg. Its mouth looked to be about two feet wide, puncturing six inches into Tanner’s leg. That’s when he started hitting the gills of the shark and it released him. He then swam to shore and instructed people nearby how to apply a tourniquet with his leash. Since Tanner is a nurse, he was able to give them easy instruction. There have been 27 shark attacks on the Oregon coast in the 40 years. As to whether Tanner will be out there surfing again, he said you bet. Some words of advice, though said Tanner: know your blood type, know how to tie a tourniquet and realize shark’s feed at dawn and dusk.